Low assessment performance at an early age can have far-reaching effects. Despite debate about inherent racial bias, standardized tests remain the preferred performance metric for determining whether students are prepared to handle grade-level subject matter and advance. 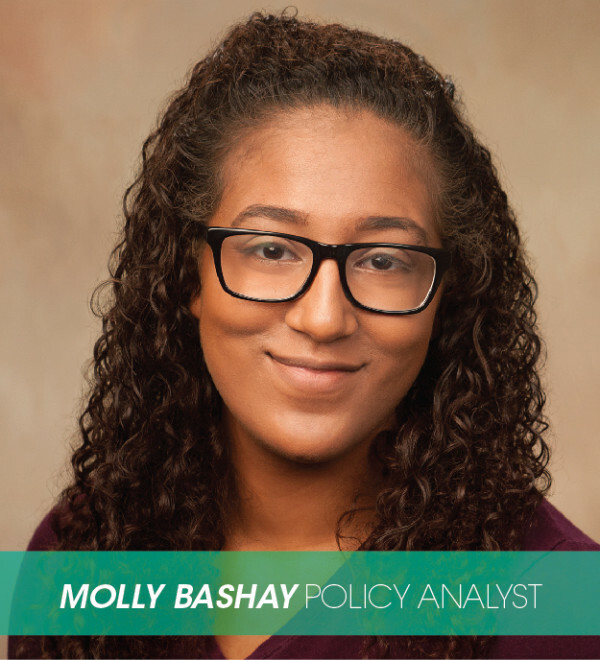 Students who fall behind at an early age are at risk of falling further behind or dropping out, diminishing the likelihood of postsecondary enrollment and completion, which affects income potential and makes economic security more difficult to obtain. 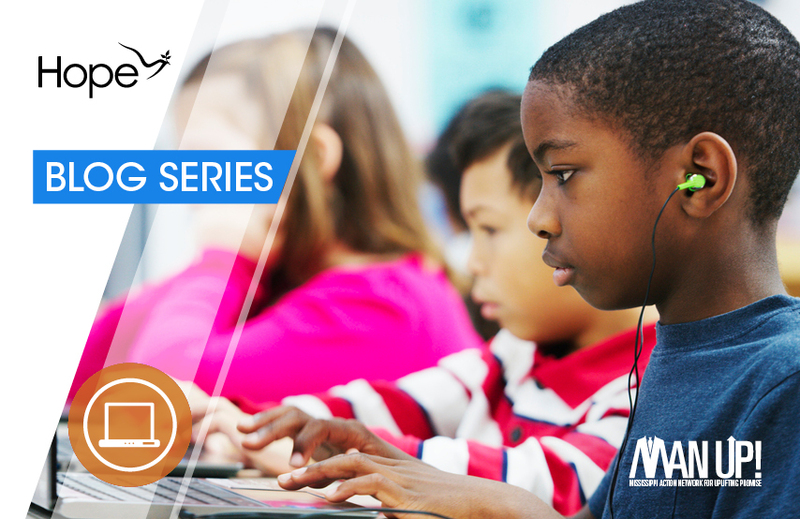 In 4th and 8th grades, students take the National Assessment of Educational Progress (NAEP) to gauge reading and math proficiency. Through uniform testing across the nation, NAEP provides insight into whether students have mastery of grade-level concepts in core subjects. 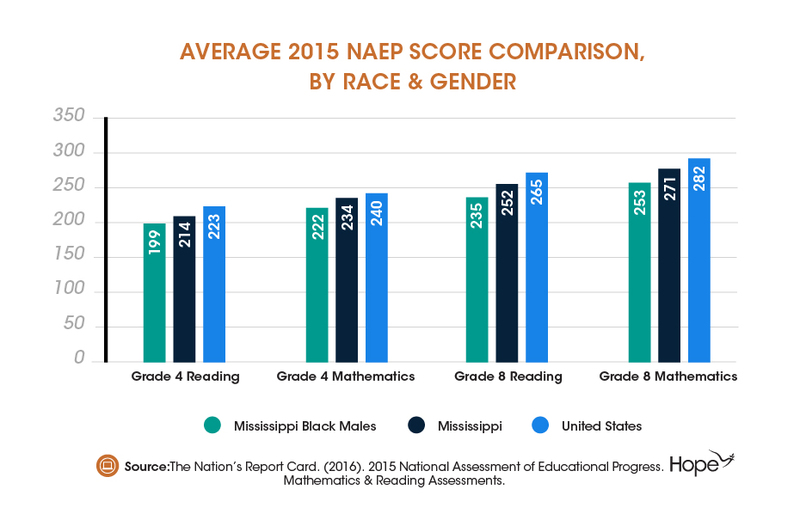 Mississippi routinely scores below the United States average in NAEP, and reading and math scores for Black males are consistently lower than both the national average and state averages. See Chart. The NAEP score gap between Mississippi Black males and state and national averages persists from the test’s inception until today. One state-level measure of subject mastery is the end-of-year assessment in English and mathematics, the Mississippi Curriculum Test 2nd edition (MCT2). The MCT2 is administered to all public school students from 3rd through 12th grade and scored at four tiers (Advanced, Proficient, Basic and Minimal proficiency). Mississippi’s Black students are least likely to score in the top two performance tiers (Proficient and Advanced) on MCT2 assessments and the Subject Area Testing Program, 2nd edition (SATP2, which tests proficiency in Biology I and U.S. History I) of all racial and ethnic groups reported. Increasing performance by eliminating the score gap between White and Black students could diminish disparities in graduation rates, postsecondary enrollment, and even future earnings. External factors beyond students’ control help determine academic success. One of these factors, school funding, is particularly relevant in Mississippi where the public school funding mechanism, Mississippi Adequate Education Program (MAEP), has been fully funded only twice since its implementation in 1997. Research shows that higher per-pupil spending is associated with higher student outcomes. Reimagining the state budget to reflect K-12 education as a priority could improve academic outcomes and build the foundation for an educated, economically secure adult workforce in Mississippi. Two upcoming reports from Hope Policy Institute, Closing the Education Equity Gap for Mississippi’s Black Males and Closing the Economic Security Gap for Mississippi’s Black Males, supported by the Mississippi Action Network for Uplifting Promise (M.A.N. U.P.! ), shed light on the complex factors that influence opportunity and uneven quality of life outcomes for males of color in Mississippi. Follow us on social media and join our newsletter for updates on this blog series and the official report release.